Bring your valentine to Grand Cayman for an unforgettable romantic getaway. With Valentine’s Day just around the corner, we rounded up 10 of our best romantic getaways for lovebirds and life-long sweethearts. From condos on Seven Mile Beach to villas in Cayman Kai, Rum Point, and Northside these hideaway homes are sure to spark your passions anytime of the year. Rates as low as $250 per night. Located in the resort neighborhood of Cayman Kai, this modern two-level beach condo is perfect for sun seekers and beach lovers. 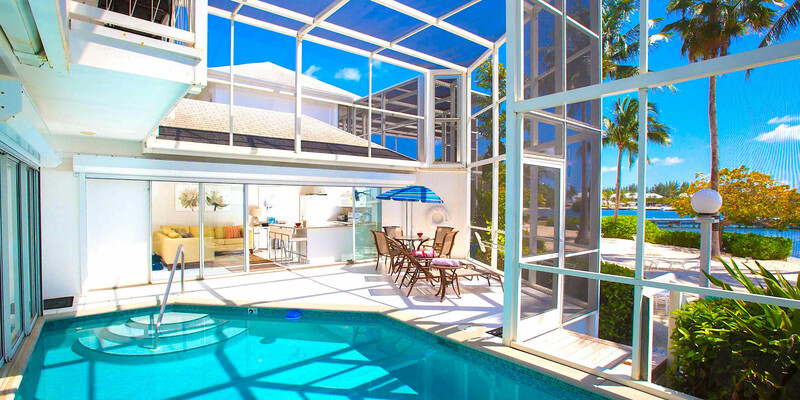 Step out of the living room and into your private pool atrium overlooking the beach. Wake up to elevated ocean views from the master suite before walking out onto the terrace with your morning coffee. The private pool atrium below allows you to enjoy the sun’s rays free from pesky bugs and insects. Walk a few steps off the pool atrium and find yourself immersed under palm trees, warm sun, soft sand and spectacular beach views. A romantic night of fine dining is just a short walk away at the Kaibo Upstairs. The Kaibo also has a casual beach restaurant and bar that you’re sure to love. Rates as low as $225 per night. This cozy Caribbean cottage along the South Coast is brimming with island charm. But, the real draw is its 300-foot wide stretch of pristine beach! What a beauty! Over 300 feet of private beach awaits you and your +1. Located across the street from the home, Sea Beauty’s private beach lot is dotted with picnic tables, hammocks, sun loungers, and palapas for shade. 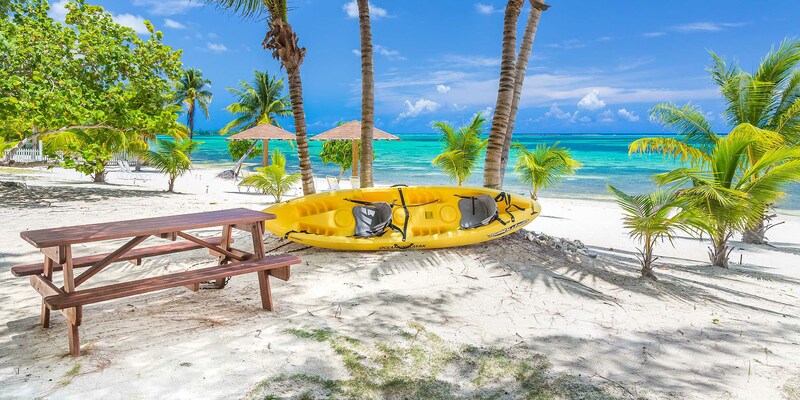 A tandem kayak is included with the home perfect for adventurous couples. Sea Beauty is also an ADA-friendly home complete with wheelchair ramps, wide entryways, and a roll-in shower. A beach wheelchair and a floating Mobi-Chair is available for disabled guests to enjoy the beach and water. Rates as low as $350 per night. 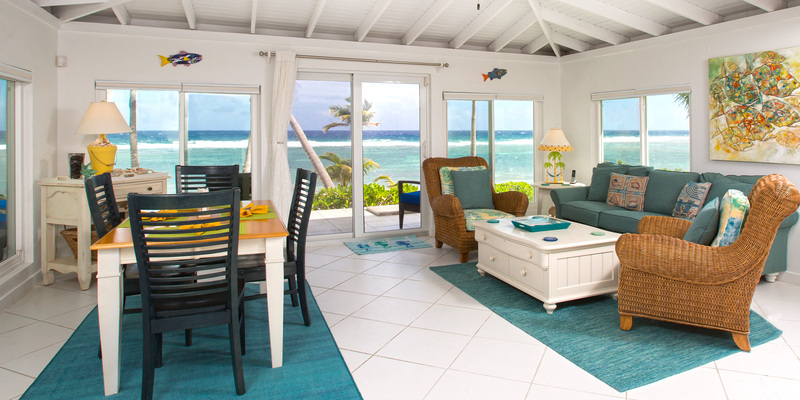 Cool Change is another charming Caribbean cottage located on the island’s Northside. Recently renovated and freshly furnished with vibrant decor, Cool Change feels like a cozy hideaway made for couples only. Stunning ocean views from the living room at Cool Change. Fall in love with ocean views throughout the home or from the oceanfront patio watching as the waves break in the distance. Descend the sandy pathway hand-in-hand for romantic sunset walks on the beach. The snorkeling here is fantastic but be sure to wear foot protection or fins when in the water. Rates as low as $450 per night. 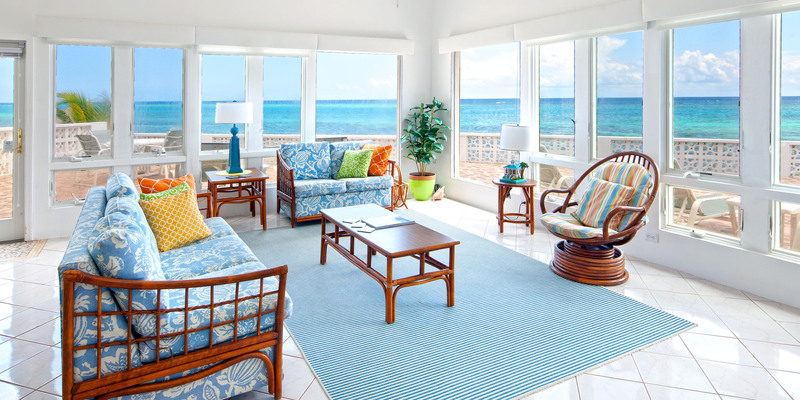 This beachfront condo resort is nestled along the glorious shores of Seven Mile Beach. You’ll feel like you found heaven on earth with lush tropical landscaping, soft barefoot sand and crystal blue water. Spend your romantic holiday in a real heaven on earth! Plantana #32 is a recently upgraded second floor oceanfront condo conveniently located close to the pool. Make no mistakes about it, Seven Mile Beach is the perfect beach. But, if you’re looking for privacy and a get-away-from-it-all kinda vibe you’re better off staying at a villa. Rates as low as $475 per night. Pool. Check. Hammock cabana. Check. What more could you want? Jump in the pool, take a dip in the hot tub, or catch some z’s in the hammock. Well, how about a dock and kayaks? This Cayman Kai hideout sits on Grand Cayman’s Bioluminescent Bay, one of the few BioBays in the world! Launch kayaks on a moonless night and watch the water glow as you glide across the bay. Another option is to book a sunset cruise or dinner charter with Silver Thatch Watersports. With the home’s private dock they can pick you up and drop you off right in your backyard. There’s nothing more romantic than a night on the water under starry skies. Rates as low as $305 per night. Vacation above the waves at this contemporary villa in Old Man Bay. Ocean views surround you at KiToCay. Featuring an over-the-water patio you’ll feel like you’re on the deck of a cruise ship with the wind in your hair and the waves breaking below. Just don’t go about trying to recreate the “I’m flying!” scene from Titanic. With fabulous snorkeling nearby and a private beach lot to the east, KiToCay is a water lovers paradise. Rates as low as $750 per night. 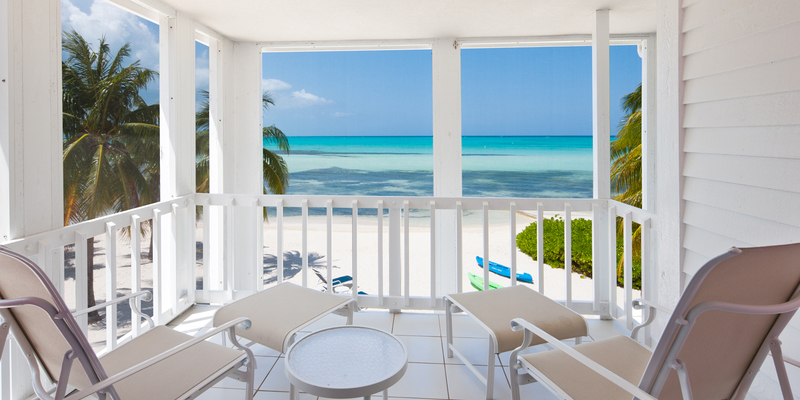 Stay in the heart of Seven Mile Beach and experience the ultimate in barefoot luxury at The Beachcomber. Interior and terrace views from The Beachcomber. This third floor condo will leave you breathless with its elevated beach views. Enjoy magical sunsets walking down the beach hand-in-hand, or take in the views with a champagne toast from your private terrace. The resort also features an oceanfront infinity pool with two spas and plenty of beach loungers for sun seeking guests. Rates as low as $400 per night. Start your days in paradise rising to these incredible ocean views just off the master suite. Bedroom terrace views to die for at We’ll Sea. This charming 2-bedroom beach cottage sits on a perfect white sand beach with clear shallow water perfect for barefoot swimming. The Rum Point Club is just a short walk away for al fresco dining, watersports, and excursions to Stingray City, the island’s #1 attraction. Sunsets on the beach here are breathtaking as the home faces west over the North Sound. Rates as low as $270 per night. Enjoy your own private slice of paradise at Conch’ed Out. 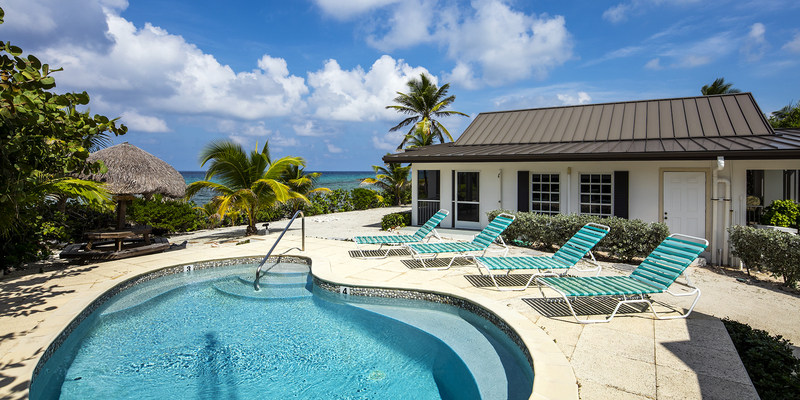 Get away from it all and lounge by the pool at Conch’d Out. This secret hideout sits on a deep oceanfront lot surrounded by lush tropical landscaping ensuring privacy throughout your stay. 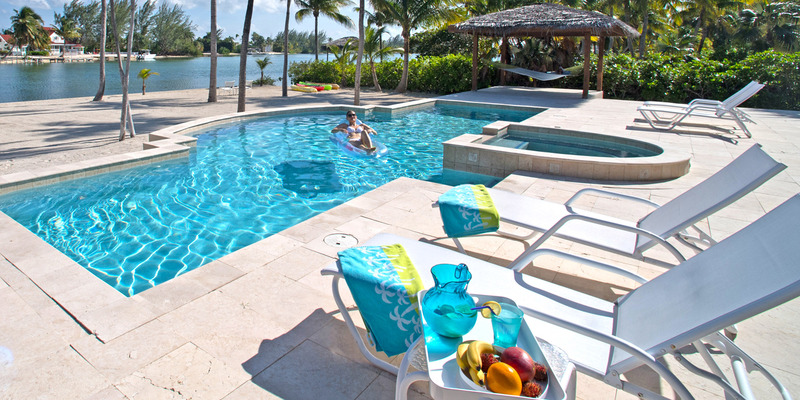 Lounge by the pool or grab your snorkel gear and explore some of the island’s best coral reefs. Either way, you’ll feel like the only people on the island at this cozy hideaway. You’ll fall head over heels in love with these stunning views! Crystal blue vistas as far as you can see. Located a short walk from the Rum Point Club, this cozy 2 bedroom cottage boasts a large oceanfront sundeck and a sandy stretch of beach perfect for lazy days in the sun.